Traditions are important to a family. Things that are given to a child when they are young can be given or passed down to ones own children. 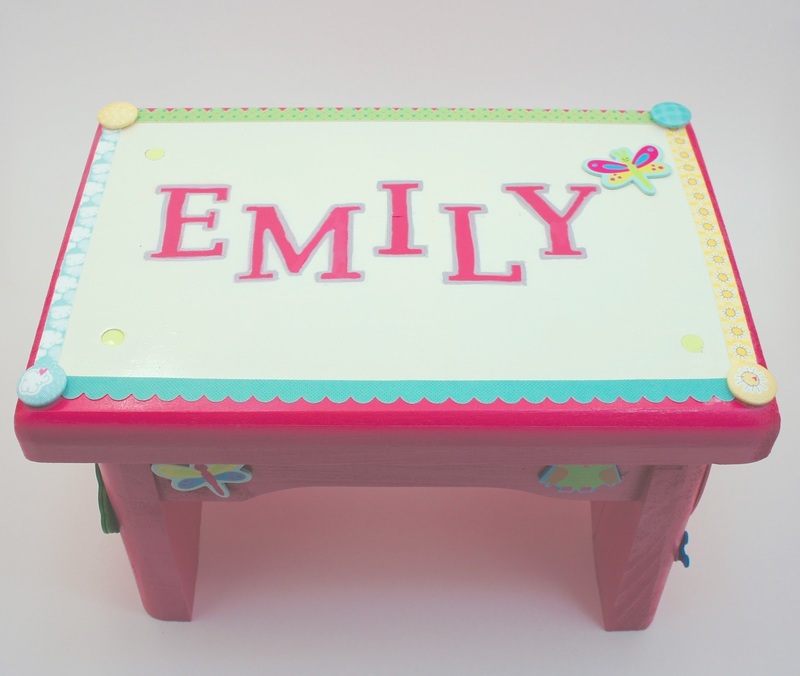 Part of a tradition that I have started with my sister’s children is to personalize their own step stool. For a child a step stool is more important than you know. As adults we forget that we can see ourselves in the mirror standing up. We forget the importance of making funny faces and sticking our tongue out when brushing our teeth. My husband still has his step stool that his maternal grandfather made for him. It was crafted by hand and still is able to do its job over thirty years later - his younger (and shorter) sister had used it last. Knowing that it has held up and our own children will be using this makes my heart happy. I didn’t craft this wooden stool myself, it was purchased at a craft store. However, I put the time and effort into sanding, painting, and decorating. Oh and don’t forget, transporting up north to NY. Each of my nephews, niece, and now my youngest niece will get hers. It is always nice to see all the stools lined up in the bathroom, in used condition. My sister’s oldest is now in third grade and he is so tall that it wouldn’t be required anymore, but it is nice knowing that it helped him out for so many years. Before you paint or spray paint the stool make sure you sand it down and clean the excess debris off. It requires a few coats of spray paint and then a final clear coat of gloss. The top was painted with an off white spray paint. After taping the top with painters tape, I used the same adhesive stick on letters that were used in my personalized subway sign. They came off really easily after spraying with the white. They are outlined with a silver paint marker. The clear gloss was the last step in the painting process before the decorations. My oldest niece was the first girl in the family so when I made her step stool few years ago it was done "princess style". She is a little princess so it was very fitting. Glitter spray, tiaras, and lots of bling were the style. For my younger niece's stool it was done with more of the cutesy nature directions. All of the buggies came painted from Michael’s and I couldn't resist when I saw them. They were attached to the sides and top using wood glue. The outline of the white is actually a self-adhesive fabric border and fabric buttons that I found at Joanne Fabrics. A hot glue gun was used to make sure the buttons stayed on. No matter how you decorate it, the step stool will be special because it will be there to help them when you aren’t. Being so far away from my family it makes me wish I could be there to help out more, but I guess I am in a way!